Leave your trail mix and dehydrated meals at home and bring a portable stove with you instead. Most modern portable stoves are built with features that provide the perfect complement to camping and recreational activities. These stoves usually incorporate a compact and lightweight design for maximum portability, together with a strong and durable build for braving the elements of the outdoors. Some of the portable stoves made today even have excellent heat control and simmering abilities that will give standard kitchen stoves a run for their money. To narrow your search of finding a portable stove that meets your needs, check out the list below. The Coleman Campingaz Twister® 270 Plus Stove is the ultimate solution to prepare warm and hearty meals on your arduous backpacking trips. Its lightweight and foldable arms for compact and easy storage makes it convenient for you to bring it along anywhere. At just 3 minutes and 45 seconds, you can boil one litre of water. Plus, it’s incredibly user-friendly as it features an effortless, one-click system to install cartridges. There’s even a heat screen to protect your hand from the flame when you operate the control knob. Take your kitchen to the outdoors with the Coleman Campingaz Bleuet® 206 Plus Stove. The stove’s pan supports are made of stainless steels which are resistant to heat and corrosion. It even has an integrated stabilizer to make cooking on uneven terrain in the wilderness more secured. During windy days, just attach its detachable windshield around the burner to protect the flame from being put out. To top it off, the stove features a control knob that’s easy to operate and allows for precise flame adjustment. When the power is out or your household’s gas tank becomes empty, the last thing you want to hear is the sound of your stomach grumbling. The Coghlan’s Emergency Camp Stove is ready to bail you out of any ravenous situation. This compact and durable stove does not require any liquid fuels, priming, wicking or pressure. All you have to do is light up the convenient fuel tablets that are included in the package. With just two tablets, you can boil one cup of water in three short minutes. All you have to do is screw the APG STO00477 Anti-Scald Portable Stove to a canister for some reliable on-the-go cooking that won’t hurt your wallet. This stove won’t take up much room as its support frame is collapsible. The surface of the pan supports features like anti-skid teeth to ensure your pots and pans remain secure throughout the cooking process. Safety is also a priority with this APG stove as it adopts a leak-proof design to prevent gas from leaking. Powered by a gas canister, the Kovea Solo Gas Stove KB-0409 produces large flames with its efficient burner system. The Solo gas stove is very convenient to carry around with its folded configuration. To boost its portability even further, the flame control valve is made of aluminium to make the stove even lighter. The stove utilizes a convenient push-button Piezo ignition that has been built into the valve, making it so that you don’t even need matches or lighters to start a fire. 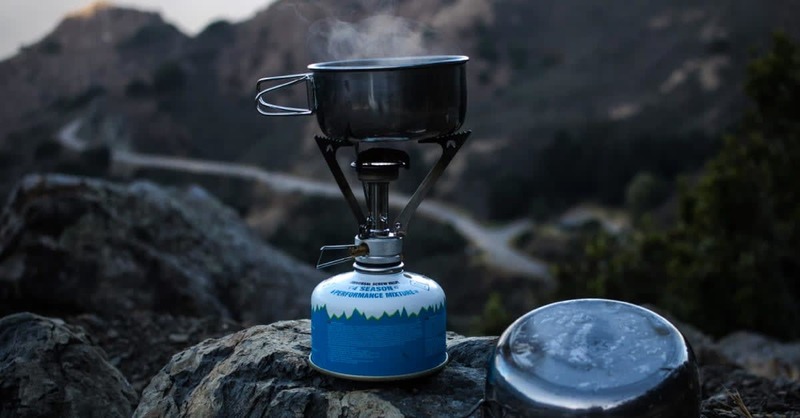 The BULIin Mini Titanium Gas Stove is the epitome of convenient portability. Combining both its ultra-small dimensions and its meager 35g weight, you can fit this entire stove into your pocket during your trip. With its titanium alloy build, the stove boasts high strength, corrosion resistance and is capable of withstanding high thermal intensity. As an added bonus, the stove is foldable for easy storage. The Lebensstil Kollektion’s Portable Induction Cooker is a solid pick for whipping up your favorite dish in the kitchen. This cooktop features nine power levels and nine-step temperature settings to allow you to perfect your recipe. The cooker also comes with an 1-99 minute digital timer which automatically shuts off once time runs out. Additionally, the stove prides itself on its impressive thermal efficiency of more than 90%. The Camp Chef Everest stove pumps out a ton of cooking power with its two beefy burners. Who says you have to skimp on delicious meals when outdoors? With the stove’s impeccable simmering ability, you can prepare diverse meals at great cooking precision. This stove also has the ability to maintain its powerful flame during windy conditions. As far as portability is concerned, the compactly-designed Camp Chef Everest is easy to pack up into its case and fit snugly in your car. With the innovatively-designed Biolite CampStove 2, heat from burning renewable biomass like twigs and sticks can be used to generate usable electricity. This electricity can then be used to either charge your devices or power the internal fan jets to make the flame for cooking burn even hotter. Surplus electricity is stored in the internal battery so you can charge your device via USB even when there’s no flame. To top things off, the stove comes with a smart LED dashboard to provide you with real-time feedback so you can manually control the fire strength, power output, and fan speed settings.